We are a group of concerned residents trying to better and beautify our community. We cover an area spawned by Jane Street in the West and Northwood & Dells Parks to the East. Though most of our membership is in Ward 9 (East of Jane St), we are open to people from the adjacent Ward (West of Jane St) who may have felt underrepresented. The establishment and operation of a residents association for the purposes of fostering and advancing the interests of the residents of the community and to carry on research and investigation into problems connected with ownership and development of real property in the community. 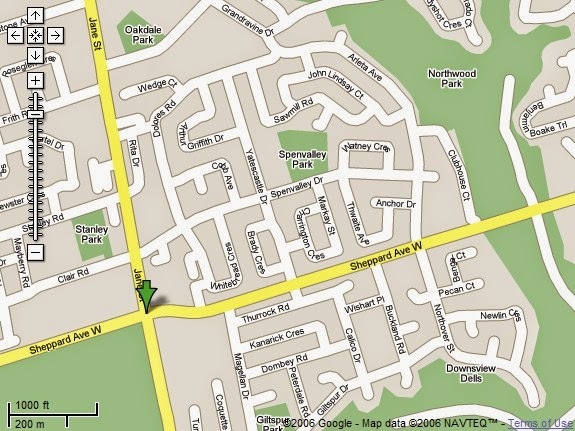 Our association was started in 2006, after several residents from our neighbourhood attended a particularly insulting City Hall meeting where the redevelopment of 1900 Sheppard Ave W, located at the intersection with Jane St, was discussed. There was a feeling of powerlessness and despair, democracy seemed a pretty theory with little applicability, the city was not listening and it seemed as if politicians did not care. Even our City Counselor, Maria Augimeri, who was generally supportive of our efforts, lost her patience in a meeting and publicly stated that some residents are "stupid" and are not listening. Most other counselors were downright hostile and far more contemptuous to the people in our community. In this dire situation, a few residents remembered Margaret Mead's words: "Never doubt that a small group of thoughtful, committed citizens can change the world. Indeed, it is the only thing that ever has." and decided to form an association. We were helped by the office of our City Counselor - they printed a few hundred flyers for us to distribute and we printed some more, then we went around the neighbourhood distributing them to households, letting residents know about our upcoming meeting, which we had booked with at a city-owned community centre. As a result of our efforts, several hundred people attended our founding meeting, held at the Northwood Community Center, 15 Clubhouse Court. People filled the largest conference room, prompting warnings from staff that we may be testing fire safety regulations - estimates vary from 200 to 400. On that occasion, we elected our executive and we raised a couple of thousand dollars. Following this meeting, we registered as a non-profit corporation under the name Sheppard West Neighbourhood Association or, in short, SWNA. We then opened a non-profit bank account with BMO and set it up so that no money could be taken out unless the cheque was signed by at least 3 members of the executive. We also set up a free website on Yahoo! Geocities (now defunct, but archived) and a free domain name, SWNA.tk. We then focused our efforts in trying to either block or improve the eminently racist project, supported by virtually every level of the Canadian government. See, for an explanation, the deputation of Shedrack Agbakwa from the African Canadian Legal Clinic. Our efforts culminated with an appeal at the Ontario Municipal Board (OMB) and we managed to change the original project for the better. As our association matured, we moved our web presence from the free website to our own domain name and a hosted CMS. We then moved to a "sheppardwest" blog, and we are now in the process of transferring our content to a new platform. That is, nonetheless, a slow-progressing endeavour. If you have questions or would like to contribute, please contact us!